The Puff Doggy arrived in good condition. The red and black color scheme is sharp and appealing. There's a reflective Stunt Puppy logo on the chest and on the left side a Puff Doggy tag. The Puff is nicely made. The fabric, seams and stitching are all even, intact and of good quality. I especially like the stretchy finished edge along the bottom of the jacket. There are two elastic straps attached to the chest of the jacket. The buckles on the strap are adjustable to dial in the fit. The buckles match up to their counterparts found on the left and right sides of the jacket. On the inside just below the collar is a built-in stuff sack. The Puff Doggy looks and feels like it would be warm. The functional design of the puff comes with hardware that is well-placed and easily operable, all in a stylish, outdoorsy, doggy, kind of way. The Puff Doggy did not come with any use instructions. I feel as a dog owner there is no need as the jacket is obvious. There are tags and labels with product care and warranty. There is, however, mention on the Stunt Puppy website that the Puff Doggy is ideal for camping, sedate winter walks and not intended for running through the bush. The suggestion is the same care is needed with this jacket as I would give my own insulating layer. Air outside frequently. Ocasionally machine wash, on warm. Fasten buckles, use delicate cycle, use tech-fabric wash or mild soap and avoid fabric softeners. Line dry and cool tumble to finish and puff. Do not iron, do not bleach. One year from date of purchase goods to be free from defects in material and workmanship. Specifically excludes damage due to wear and tear, chewing or product misuse. If product fails to comply with warranty remedy is limited to repair or replacement of product. After looking over the Puff Doggy myself I called Oscar over to have a look and a sniff. I then slipped the jacket over his head. I passed the chest section underneath and passed the straps up to the side. 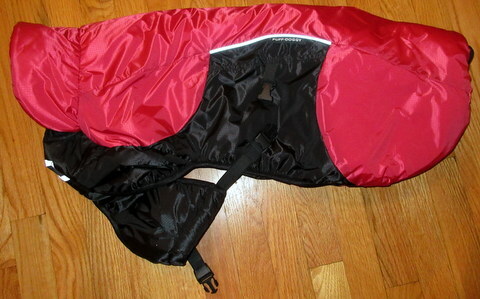 After attaching and adjusting each of the side buckles the Puff was on. Oscar showed very little reaction. I took this to mean he didn't mind it. I then noticed two thin elastic straps at the rear of the jacket. They looked perfectly positioned to go around Oscars hind legs. I gently one at a time lifted his feet and slipped the straps around his upper leg. While doing so I noticed another smaller elastic between the other two. I assumed this one would go around his tail. During this time Oscar seemed to be raising an eyebrow and looking under his leg. I don't think he was completely comfortable with the straps so I didn't bother trying the tail strap. The Puff fits Oscar well and covers his neck, chest, back and sides nicely. All materials and construction look to be of very good quality. Stunt Puppy says they use "human grade" fabrics, I never knew this was a thing but looking and feeling the Puff I understand what they mean. If handed the Puff with my eyes closed I wouldn't know it's a dog jacket. It feels just as soft and has that coziness of an insulated puffy jacket. While Oscar didn't seem to care for the hind leg straps I think I like them. The other insulated jacket we use flops up when Oscar runs leaving the rear half of his back exposed. Come to think of it Oscar just might end up liking a warmer back too. We only ventured outside to snap some quick photos with the Puff. We didn't go too far but we walk every morning and tomorrow is going to be a cold one. We'll get our first real experience then. We went back in and removed the Puff Doggy. Taking the jacket off is as easy as putting it on. 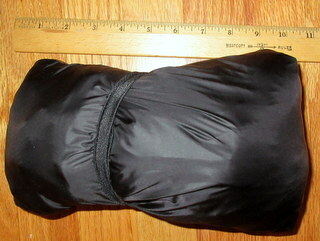 The Stunt Puppy Puff Doggy is a nicely designed well made insulated dog jacket. It fits Oscars nicely and he seems to like it. I like the adjustability of the straps and secure fit the rear leg straps provide. I am slightly concerned about durability as Oscar likes to roll around in the snow sometimes and run off trail a lot. I am curious to see how well the Puff works while it's snowing and if there's any change in Oscar's behavior when it's really cold. Well with that said I am going to take the advice at the bottom of the tag on the Puff. "Now that you're done reading this - go take your dog out." 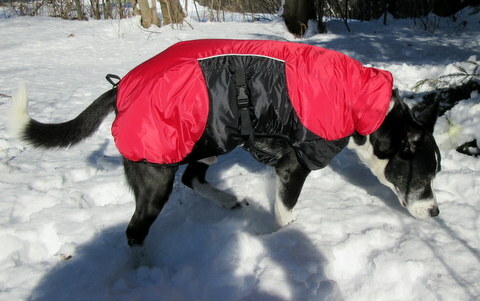 Oscar and I have used the Puff Doggy on three hikes, one cross country ski and roughly two dozen morning walks. On all occasions I have been happy with the Puff and the best I can tell Oscar was too. Whenever I pulled the jacket out Oscar would step toward it and allow it to be pulled over without fuss. It was always easy to put on even early in the morning in the dark. Oscar's harness is compatible with the Puff and never posed any difficulty leashing him. Our first hike was not super cold and more of get acquainted outing. I wanted to be sure Oscar could do all his usual dog stuff wearing the Puff. All went just fine and we had our usual up and down at our nearest hill. Our next hike was longer and colder. At around 15 F (-9 C) I know Oscar starts to feel the cold. He is less likely to stand and wait for me. Usually when I fall behind he will stand and wait till he can see me before moving on again. At the above temps he will continue to move unless called back. In which case he will return to me then turn and continue on again. My interpretation is that he is cold and stays moving to generate heat. Wearing the Puff Doggy Oscar would pause and wait for me on the trail. This to me means that with the additional insulation he is staying warm. Then the real cold came and we saw multiple -10 and -15 F (-23 and -26 C) mornings. Oscar and I walk a mile (1.6 km) almost every morning. At these temps I would normally skip it and go in the evening instead. Wanting to see if the Puff Doggy could help we layered up and went for it. Oscar motored on without a complaint. By the end of the walk we both had formed breath icicles on our whiskers. We had about two dozen of these types of walks and made each one without hesitation. 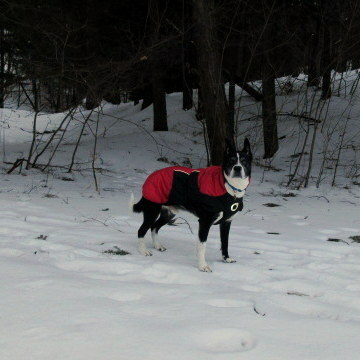 The confidence in Oscar's comfort at such temperatures encouraged me to take him on snow cover at 0 F (-18 C). Surrounded by cold air is one thing. Standing on cold snow in cold air is even more chilling. Again Oscar ran hard. He would circle back when too far, wait a moment and then take off "exploring" again. He never did the "stork". This is what I call the move he does when his paws are too cold. He attempts to remove one from the uncomfortable ground by lifting it in the air. Invariably the other three are just as cold so his keeps uncomfortably switching legs. On this cold and snowy hike wearing the Puff this did not happen once. Our last outing during this stage of testing was on a mild and sunny cross country ski. Oscar didn't wear the Puff while on the move. I stuffed it inside its built-in storage pouch and then tossed it in my pack. It took up little space and added unnoticeable weight. When we reached our snack break spot we both put on layers to retain our warmth. The Puff Doggy easily unpacked and fluffed quickly with a few shakes. Oscar was so happy after our snack he did his roll on the back then stood up and rubbed his face through the snow dance. The Puff didn't inhibit his moves nor was it any worse for the wear. Before moving on we removed and repacked our layers. The Stunt Puppy Puff Doggy has been fun and easy to use. It fits nicely and stays in place while walking and running. It has kept Oscar warm and active on some really cold days. After each use I would touch the exterior of the Puff which was cold. Then after removing it touch the interior and Oscars back, both were warm. So I know it's providing real insulation to his core. The Puff so far has held up to outdoor dog wear with only one mild snow roll. We have had nothing but positive experiences with the Puff during this stage of testing. As of writing this spring has arrived. Even the morning temperatures have not warranted using the Puff. I do not foresee much use for the Puff until late fall. There is however potential for the Puff to fulfill the role of doggy sleeping gear. I have my fingers crossed that we can manage an overnight hike during the next stage of this test. This concludes my Field Report. Over the next two months Oscar and I hope to get some more use with the Puff Doggy. Please return then for our Long-Term Report. I would like to thank Stunt Puppy and BackpackGearTest.org for the opportunity to participate in this test series.